Taylor Swift to Debut 23rd Music Video on MTV During Weeklong Birthday Celebration. - Oh No They Didn't! Taylor Swift to Debut 23rd Music Video on MTV During Weeklong Birthday Celebration. 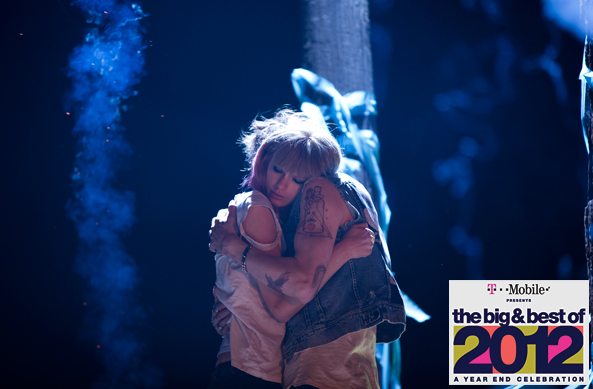 The multiscreen rollout for "I Knew You Were Trouble" kicks off Monday with never-before-seen photos from the video shoot on MTV.com. Tuesday, the site will publish clips of Swift on-set discussing the creative concept for her dark video, as well as a video chronology of all 22 of her previous video offerings. On Wednesday, Swift will count down her top five moments of 2012 via livestream followed by a trailer of the new video.The video itself is slated to premiere on MTV at 4:40 p.m. ET on Thursday before going into rotation across all MTV channels at 5 p.m. ET. Swift will debut the official clip for “I Knew You Were Trouble” on MTV as the capstone to a weeklong birthday celebration, The Hollywood Reporter has learned.